Challenging the Bonsai A to Z entry for Bark cleaner. Keeping old bark in pristine condition is a perennial problem, especially in the U.Ks damp climate. Because of the damp weather and regular watering, bark, which is very absorbent tends to be the perfect place for green algae to colonize. After time this can become quite thick and if not cleaned away will progress to a lush carpet of green moss, under which the precious old bark will be decaying. 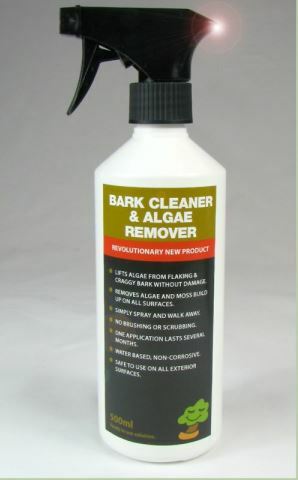 Bark Cleaner and Algae Remover solves this problem. The product harnesses the power of sunlight to lift algae away from the supporting surface, it then simply dries up and blows away. Treatment involves spraying the affected area until it is evenly damp and putting it in the sun to take effect. There are 819 entries in the A to Z and the pages have been viewed 3061133 times. Help us to increase the number of relevant bonsai terms included in this A to Z of Bonsai Terms. We include manufacturers and dealers in the dictionary, if you are one or know of one not mentioned then just click the link above and add an entry. If you have a favourite bonsai tree not mentioned just add an entry. We are trying to create a unique single free source for all bonsai terms and hope to capture worldwide bonsai terms for bonsai trees, bonsai clubs associations and national collections and the A to Z is free marketing for bonsai businesses and bonsai clubs.